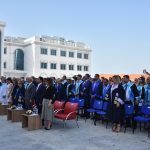 University of Kyrenia (UoK) 2017 – 2018 Spring Semester Graduation Ceremony took place at University of Kyrenia campus. The Head of Higher Education Planning, Evaluation, Accreditation and Coordination Board (YODAK) Prof. Akile Sarıoglu Buke, UoK Founder Rector Cemre S. Günsel Haskasap, UoK Rector Prof. İlkay Salihoğlu, Vice Rector and Dean of Faculty of Education Prof. Gökmen Dağlı, Vice Rector and Dean of Faculty of Medicine Prof. Rüveyde Bundak MD., Vice Rector of Near East University (NEU) Prof. Fahrettin Sadıkoğlu, Vice Rector of NEU Prof. Murat Kocaoğlu, Master of Kyrenia Harbour Kutlu Bayramoğlu, Chief Physician of Dr. Suat Günsel University of Kyrenia Hospital Prof. Nail Bulakbaşı MD., deans of other faculties, UoK Founding Board of Trustees Member Mehmet Soykurt, Director of Education Foundation of UoK Mutlu Soykurt, vice deans, head of departments, vocational school directors, academicians, families and guests were present at the ceremony. Families and guests welcomed graduates with applauses as they entered the ceremonial ground with joy and pride. After a minute of silence and the National Anthem, the Rector Prof. İlkay Salihoğlu made the opening speech. During his speech Prof. İlkay Salihoğlu underlined that the university is successfully expanding each day with different investments such as the ‘English Test Center for Aviation’ for the Faculty of Aviation and Space Sciences. 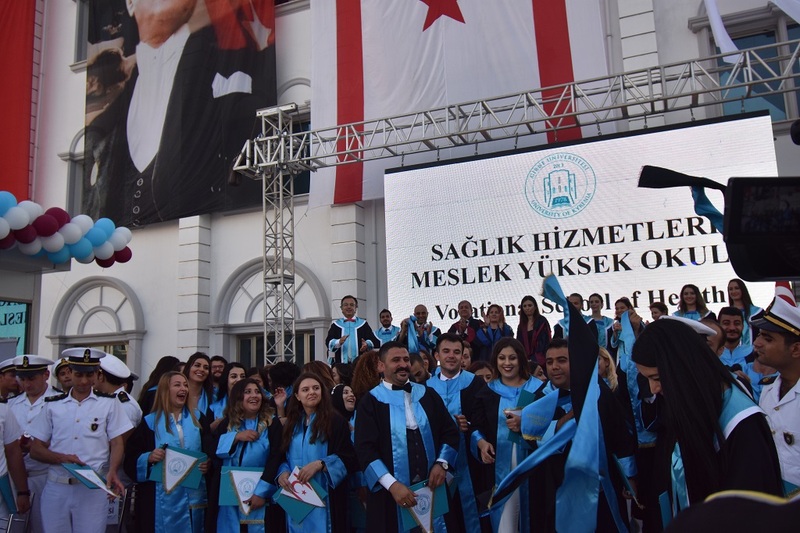 Prof. Dr. İlkay Salihoğlu also wished success to graduating students for their future lives and careers, and stated that they would like graduates to stay in touch. Following the opening speech, President of YODAK Prof. Akile Sarioğlu Büke presented the certificate of achievement and gift to Burhan Aşır from the Department of Professional Pilot Training, for achieving the highest score in the University. After receiving his certificate and gift, Burhan Aşır made a speech on behalf of the graduates of the Spring Semester 2017 – 2018. Following the student’s speech, the diploma ceremony had started. 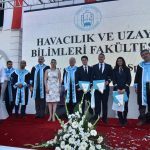 Founding Rector Cemre S. Günsel Haskasap presented the achievement certificates and gifts to the highest scoring students of the Faculty of Aviation and Space Sciences which graduated its first students. 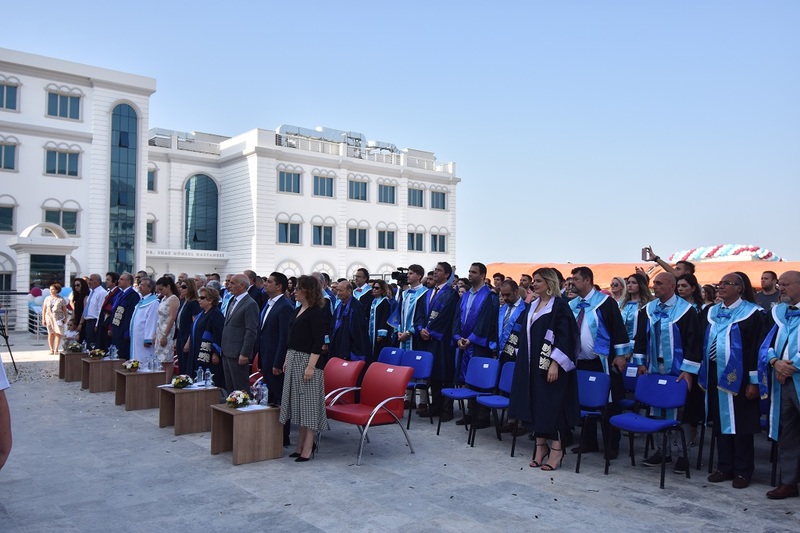 After that she accompanied the Dean Prof. Süleyman Tolun and academic staff of the faculty as all graduate students were presented their diplomas. 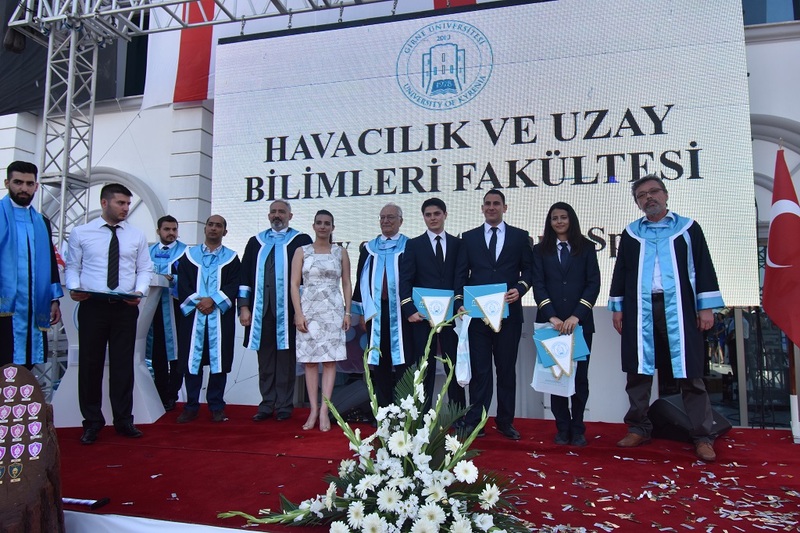 Sevgi Çetin, a student from the Faculty of Aviation and Space Sciences made a speech on behalf of the graduates of the faculty, and expressed that she is proud of being the first female graduate of the Professional Pilot Training Department. Kaseem Olalekan Adejumo spoke on behalf of the graduates of Maritime Business and Management Department. 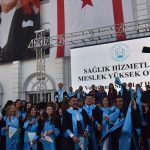 Vice Rector of NEU Prof. Dr. Fahrettin Sadıkoğlu presented Berat Aydin his diploma. The rest of the graduate students received their diplomas from Prof. Aysel Karafistan and lecturers. 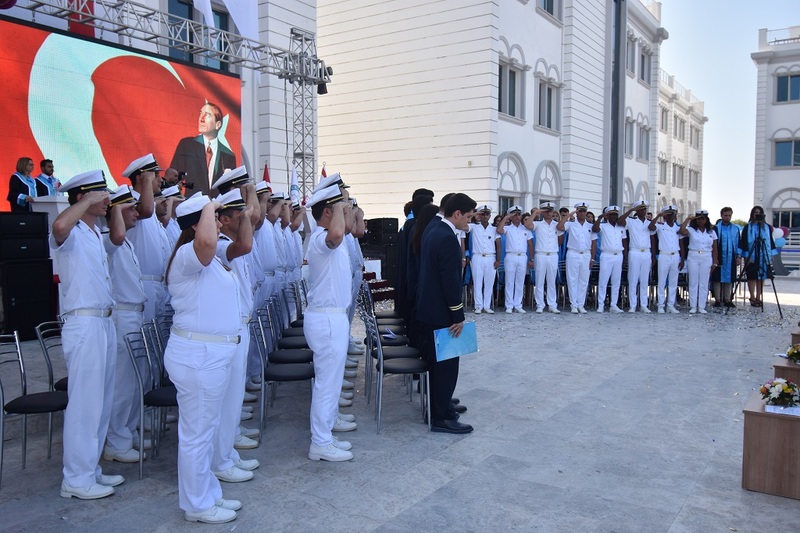 The graduate students greeted the guests with the traditional naval salute called ‘Chima Vira’. 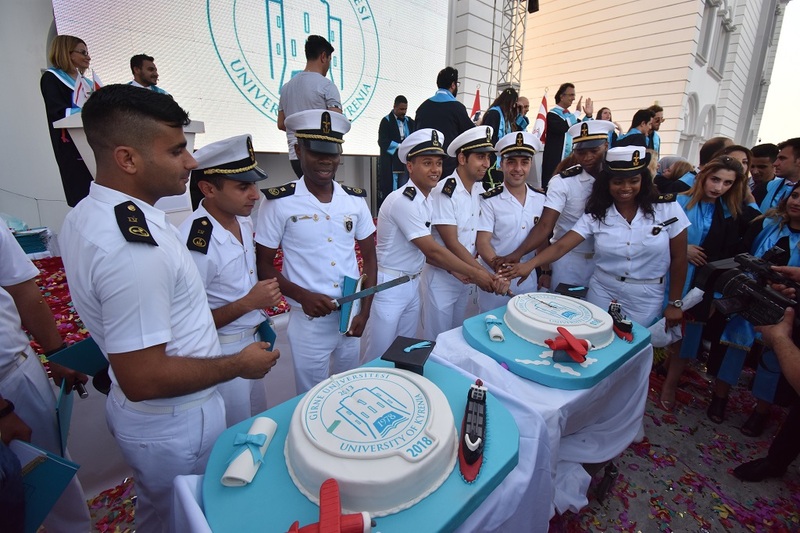 The ceremony continued with the 2017 – 2018 Spring Semester Graduation Ceremony for the Faculty of Maritime Studies, Vocational School of Maritime Studies and Maritime Academy students. Mohamed Noor Hatimy, graduate student of Marine Engineering Department, and Alkan Koç, graduate student of Maritime Transportation Management Engineering Department, made a speech. 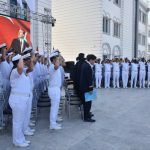 At the last part of the ceremony, the first graduates of the Vocational School of Health Services were presented with their diplomas. The highest scoring students, Burcu Güney, Eda Akyıldız and Bumin Balıkçı, were given achievement certificates and gifts by Prof.İlkay Salihoğlu, Prof. Rüveyde Bundak MD. and Prof. Arzu Babayiğit MD. Sibel Almas, student from the Department of Mouth and Dental Health, received her diploma from Mehmet Soykurt UoK Founding Board of Trustees Member Mehmet Soykurt. Later on the rest of the graduates also received their diplomas from the academic staff and recited their oath together. 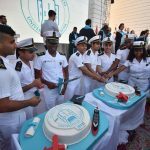 The magnificient ceremony full of emotiononal moments, pride and happiness ended with the serving of the refreshments and the graduation cake-cutting.